Criminal case U/S 376 P.P.C. Accused Imran continouely raped about 8 months victim S over making blackmail on a MMS (video). Application for cancellation of bail of accused as well as DNA testing was given. . Accused Saad kaimkhani & his 4 friends late night @ 1:35 am attacked at the house of complainant lady Mst H widow of Imam khan. Accused persons duly armed with weapons continuously fired upon the house of H. They harassed complainant and her children and threatened for assassination. Filed power on behalf of woman/complainant H beaten and attacked by the police personnel and private persons. A lady Mst Sehar Memon she was shot killed by the accused persons before the court premises as she was already been threatening and she came for getting her protection but its usually not taken seriously by the court and same day after leaving court she was murdered in cold blood. A woman who came to seek justice before the Honorable Court was killed by her husband. Assisting family of the victim to get justice. RNP has offered the family of the victim filling petition in the High Court for arresting the accused who are threatening the family to withdraw from the case. Mst Bashiran was ousted from the house by her husband Usman with her suckling children, her husband got 2nd marriage with another woman and no interest in 1st wife. Pleading for maintenance of children. With the support of the RNP Mst Bashiran received the maintenance from her husband for her and her children and matter is on evidence for dowry articles. She according to her wish and will left the house of Z and remarry with another male and went to Punjab but after some time when she was ousted by 2nd husband. She has the custody of minor children as zulifqar claims for the custody of children it’s the question of better future for children. As he is depositing monthly maintainance of children in court. Convinced both parties to enter into agreement and save the institution of marriage and the future of the children. Father is paying maintenance to the wife, children, rent for them. Abdul Razzak has builded a house beside his house and has damaged the house of Ladhooram his house arrived at very dangerous position. A poor teacher belongs to religious minority, facing issues by neighbors. Ladhooram filed a civil suit as from his Human rights application court directed him to proceed to civil court. A poor teacher belongs to religious minority, facing issues by neighbors. His place was damaged by the construction activities of his neighbor who are influential. Threatening poor teacher. Iqbal Ahmed & others 4 candidate who conducted NTS test for teacher requirements & got top in the U.C. Merit lists but top on the rest in these lists were some persons/candidate who belong to the other U.Cs of distirct and do not belong these UCs. Iqbal Jarwar & others claims for investigation of their permanent residence in these UCs and set aside the NTs merits list by the order of Honorable court. Students from different Union Councils of Tando Allahyar who applied for PST, JST whose merit is being violated by the influential people’s children who have got rural domiciles. RNP has filed HUMAN RIGHTS APPLICATION at the District Court against the education department. Raheem conducted NTS test for teacher requirement the world bank project. High court of Sindh Hyderabad. RNP has filed petition at the High Court against the education department and others for the rights of poor candidates who have right to the posts. Petitioner also on behalf of his villagers he claims that in the year 2005 sui gas scheme & a tender on the name of their village was passed by Nazim but till year 2013-12 the pipe lines were completed but no gas was on-issued in their villages as the SSGC were likely to migrate their machineries back from the village. Therefore he claimed for immediate order. Villagers whose connections of Sui gas were stopped by the department due to political and other reasons. RNP filed four petition for the metres of the 8 villages consisting of population of 6000-8000 people. Connections and metres done. Applicant was arrested when he was protested before press club chambar against the irrigation department on water issue. Assisted a journalist in his case against irrigation department. Applicant was detained wrongfully confined. Applicant Mohammad hussain claims that some accused person supported by police is openly selling drugs in his colony which is affecting bad in the environment. Filed 22 A & B against the police and drug dealers selling drugs with support of police. he has raised district Tando Allahyar ‘s present situation at the very worse point. Issue are – crime-traffice-pollution-& others issues affecting on population. RNP’s chief executive Advocate Ali Palh filed case before the Honorable District & Session Judge Tando Allahyar agaist District Police, Management and Municipal authorities for resolving the issues of the district, and providing services to the citizens. Mst Hooran has got married according to her choice and will, she has been divorced by her previous husband as now her previous husband and its her others close relatives have been antagonized on her marry who has declared her as Kari and thirsty for her murder. A lady who exercised her right to marriage who is being threatened by her former husband. RNP assisted her in accessing to the justice. Provided technical and legal assistance to business community and Chambar of Trade & Commerce for fair deal and protection of their economic rights. Assistance continued. 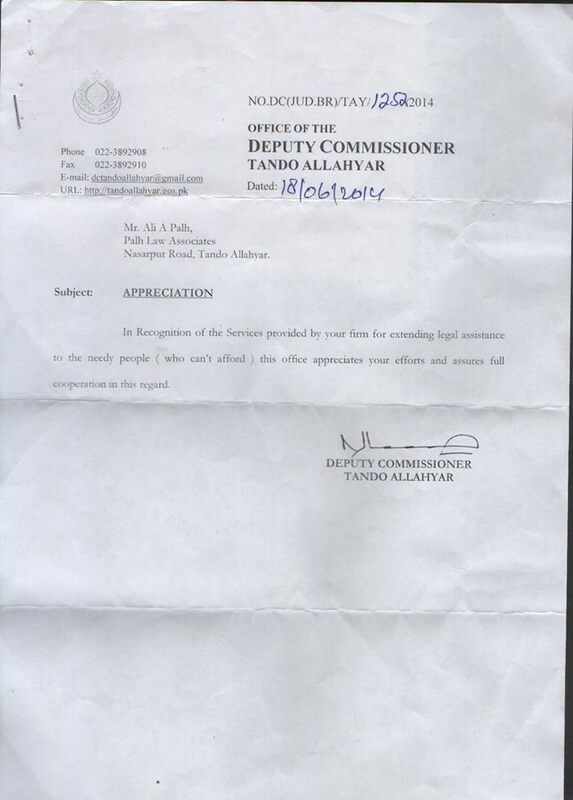 RightsNow Pakistan has received appreciation from the Deputy Commissioner of the Distrrict Tando Allahyar for extending legal support to the needy people.